Hi few readers that are looking at my blog, I hope you all had a good weekend and good morning. I want to know how you are doing - but I’m doing well, thanks for asking. I went to Breckenridge Yesterday to hit up a few slopes - the snow was fantastic - best day of the season so far, by far. Saturday was also nice, I just hung out and took a nice day off. I stayed away from the project this weekend because I needed to take a few days off as I’m confused about what the heck I’m actually doing here. It’s been less then a month, but everything seems to be falling apart here and I am very confused - I’m constantly battling with my mind every day about being as ‘good’ as I was yesterday - and I question my abilities to even be able to design apps - not to mention my Thursday/Friday posts - were just difficult for me to complete. I hope to come back today with a fresh start. Katie from Art Garage never got back to my email, which I put love into and really tried to share my passion about the project - perhaps it came off a bit desperate - which it wasn’t, it was passion. Although it would be great to join her community, if she didn’t get back it’s not the right fit - non profits should be easy to get into, but I guess i’m not even qualified for that. My teacher Allan Yu, didn’t get back to my follow up email last week either and although he said he liked the project - I haven’t been able to use it in order to continue conversations. I’m really anxious for this project to help me get off the ground but so far it’s done nothing for me and I’m a bit discouraged, but I’m going to keep it going. Hopefully the folks who haven’t responded to me will see where the project takes me and feel bad they never got back - and then when they reach out to me I won’t respond. Just kidding, I will respond, but it will be more of a f-off i’m working on something better. However, one of the main takeaways I got when speaking to Allan was how I layout my posts. He said people aren’t interested in seeing more apps, rather they want to see a problem and your solution - another form can also be opportunity - solution. For example, in NYC, Uber wasn’t solving the problem of lack of ability to commute because we already had taxis and subways, but they saw an opportunity in offering a service that allowed users to conveniently call a cab to where ever they are located. Of course Uber does solve problems, especially in cities where there were no cabs or they were too ‘sketchy’. Maybe a better opportunity example would be Lyft. Lyft came around after Uber solved all of cities transportation problems, but they saw opportunity in offering ridesharing for longer trips, often between cities, and linked drivers and passengers through the Facebook Connect application. Since then many different rideshare companies began to solve different opportunities in the space - or problems that current rideshare companies created - like Uber being too expensive. The issue for smaller rideshare companies is the ease of implementation the larger companies have access to – for example if a smaller company started shared-cabs as their main focus, Uber has the resources to knock-off the ideas quickly into their own app and destroy the smaller company - a recurring issue in business. But still these companies maintain loyal costumers and work to perfect the niche. Some examples being Via and Gett, both still surviving in their niche market - whether it be the service they provide or the locations they service. There are many ways to find emoji’s that describe a certain emotion, but emotions are comprised of multiple components - so one emoji might not do you justice. However, I see a large opportunity in creating a platform that helps you combine multiple emoji’s together in order to properly convey the emotion or action you are looking to send. It’s also way more customizable and unique. Which one would make you blush? Aside from the combinations of emoji’s the placement is also important because it will allow you to create a realistic picture. There are apps around the web that cater to a similar solution and they are based on the old idea of emoticon art and combine multiple emojis with emoticons - they are not limited in characters making the artwork extremely complex and unnecessary to getting the point across. I would like to reference the Split Flap Display’s UX. 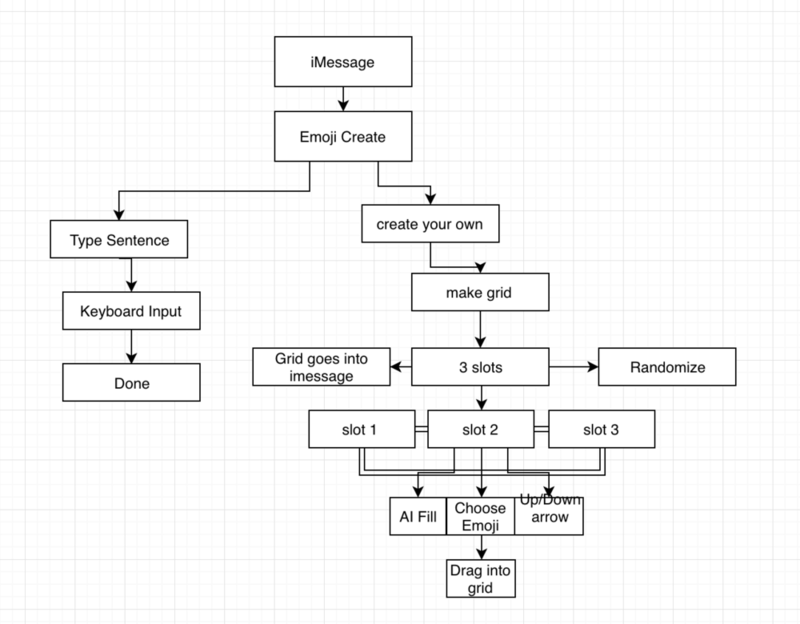 I want to create the layout as a grid - allowing users to easily move emoji’s around a pre-defined set of boxes, so the user can choose emoji’s move the layout and then copy those emoji’s for sending. In order for this to be possible there are a few questions I need to address. The first being, how to customize a layout? Off the bat, I am thinking the layout is composed of 3 boxes. The user can move the boxes around to organize their positions (It would be cute if all the text ui elements were) How to add emoji’s? The user would click on a box and a list of emoji’s will show up - once you choose an emoji it will add to that corresponding box. Could also be interesting if the Emoji’s were all in the navigation bar that you could pull out from the side and drag into the boxes - or if the emoji’s were in a flip-clock layout that you can easily browse through by flicking. Artificial intelligence will also suggest what emoji’s would look best in the box. How to add to message? I am very much considering creating this is an iMessage app. Took a last minute flight back to New York this morning - so I’ll pick this up tomorrow. I would like to create a platform that allows iMessage users to create more advanced emoji combinations by automatically converting an entire sentence to emoji’s or a drag and drop tool that allows the user to place emoji’s in any location before pasting into the message. 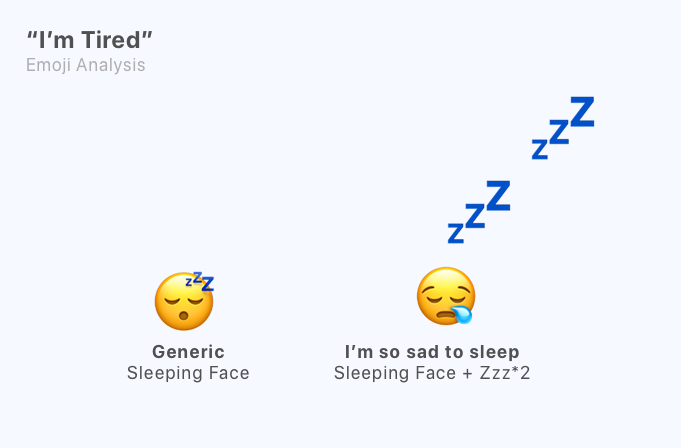 Emoji also learns your patterns by analyzing previous messages and suggests similar emoji’s for you to use in the future. I’m going to remove the sentence to emoji portion because there’s a lot I need to perfect on the emoji grid. I’m going to work on the wording and transitions for the next wireframes.